Locked In. Take the phone off the hook, you’re not going to want to be disturbed. At Jefferson Franklin Editing, one of the perks of what we do is that we get to read fantastic new books ahead of the crowd. 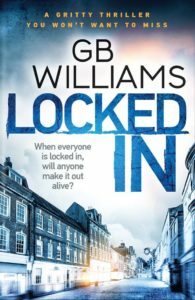 Locked In, by GB Williams, is the second of the Teddington and Bell novels, a gritty hostage thriller that’ll keep you on the edge of your seat from Page 1. We were lucky enough to read it when it came in for editing. Now it’s your turn – published by Bloodhound Books, Locked In takes the story of Ariadne Teddington and Charlie Bell, a prison guard and a former cop-turned-killer, to explosive new heights, as they’re locked in together during a bank robbery. When one is a hostage and the other’s a gunman, how can they both get out alive? Locked In is available for download at Amazon now – get your copy, and say farewell to your fingernails. That noise that’s not quite like anything familiar. That scent that has no business being there. That pause in the conversation that’s just slightly too long and changes everything. Changes today to the last day you’ll see. That’s the bodily knowledge that things are not, not, not what they should be. That things are wrong, and you might not get out of this alive. If you’re a conneisseur of fear, you’re going to want to slip over to Amazon and order yourself Last Cut Casebook, the latest short story collection from Jefferson Franklin’s own G B Williams. Thirteen short stories from the Crime Writers’ Association-shortlisted Williams (who’s one of our sought-after Senior Editors) take you into worlds of crime as amateur sleuths and professional detectives pit their wits against mad bombers, twisted predators and the serial killer next door. 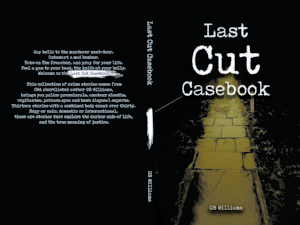 Get your copy of Last Cut Casebook today, and get reading – just make sure you do it by daylight. Tana Collins first came to Jefferson Franklin on the recommendation of her friend and fellow author, Alison Bailie, author of Sewing The Shadows Together. Tana, like Alison, had crime in her heart, and a compelling knack for getting under your skin with her storytelling. We knew big things were coming for her. She developed a strong relationship with senior editor Gail Williams, especially working on her first novel, Robbing The Dead, which introduces Inspector Carruthers, and in the growing tradition of Scottish crime mysteries, drips with characterisation, tension and twists that kept you guessing right to the end. 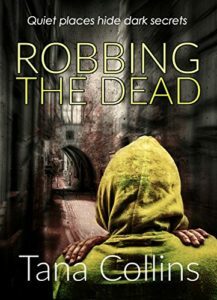 Tana recently signed a deal with Bloodhound Books for her first three novels, the Inspector Carruthers stories, and we’re delighted to announce that today, Robbing The Dead is published in both paperback and Kindle editions. You’re going to want to jump on the Tana Collins train early – the Inspector Carruthers stories will grab you from Page 1, and won’t let you go. Get Robbing The Dead and discover your next must-read crime writer. Her name is Tana Collins.